The Senate Committee on Gas has said that NNPC and Central Bank of Nigeria (CBN) are to submit documents on the withdrawal of $1.2 billion from the NLNG dividends account within the last two years. The committee decried the withdrawal from the Nigeria Liquefied Natural Gas ( NLNG). The Chairman of the committee, Sen. Bassey Akpan, made this known at the committee's investigative meeting. He said the money was withdrawn to bridge the gap of losses suffered by the Nigerian National Petroleum Corporation on landing cost of imported fuel of N185 and pump price of N145. Akpan said the investigation was in line with the mandate given to it by the senate two weeks ago, to probe the withdrawal. The breakdown of the withdrawals not supported by required approving documents as observed by the committee are 86.55 million dollars withdrawn from the account on November 22, 2016 allegedly being payment on Paris Club loans for the state governors , 1.05 billion dollars withdrawn on April 17 2018 as National Fuel Support Fund. The sum of 650million dollars was also said to be withdrawn from the account on June 7 for offsetting Joint Venture Cash Call by NNPC which ordinarily should be budget item payment. Also, the sum of 415. 1 million dollars was said to be withdrawn from the account also in June without clear explanation on purpose for which it was meant for. 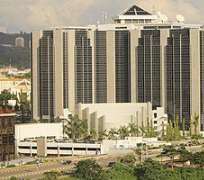 Akpan ordered CBN and NNPC to forward the documents to the committee latest Tuesday next week as well as supporting and approving documents for the withdrawals. “From the available documents before us, aside the 1.05 billion dollars we are mandated by the Senate to investigate several withdrawals also made from the NLNG dividends account without required supporting documents to back them . “This is unacceptable to us, along with the fact that the GMD of NNPC and CBN Governor are not here in person, we are not going to continue with the session today. ” Both the NNPC and CBN must furnish this committee with other relevant documents on the withdrawals latest by Tuesday next week. “Also, the NNPC GMD, the Corporations Group Executive Director ( Finance) , Isiaka Abdulrasak and the CBN Governor , Godwin Emefiele , must appear before us on Thursday next week “. He noted that the memo sent by NNPC to the committee had no clearcut request for approval for withdrawal of the 1.05 billion dollars. ” Even if it has approval for withdrawal from such fund is supposed to be given by the National Economic Council ( NEC) being an account or dividends owned by the three tiers of government . ” We are surely going to carry out thorough investigation on the illegal withdrawals to put an end to the cycle.